Survey Results: Breath of the Wild – Favorite Main Quest – What's in a Game? What is your favorite divine beast quest in Zelda Breath of the Wild? What order should you play the quests in to enjoy the game the most? In March, I posted a survey on the Zelda subreddit. I published results related to dungeon order and difficulty here and results of how the master sword affected difficulty here. I’ve finally had some time to go deeper into the results to see which divine beast people enjoy the most. The following comes from 428 responses. This graph is pretty explanatory. Zora and Gerudo are pretty well loved. Rito has the most Meh and Bads of all. Let’s dive deeper and see if there are more interesting trends we can find. 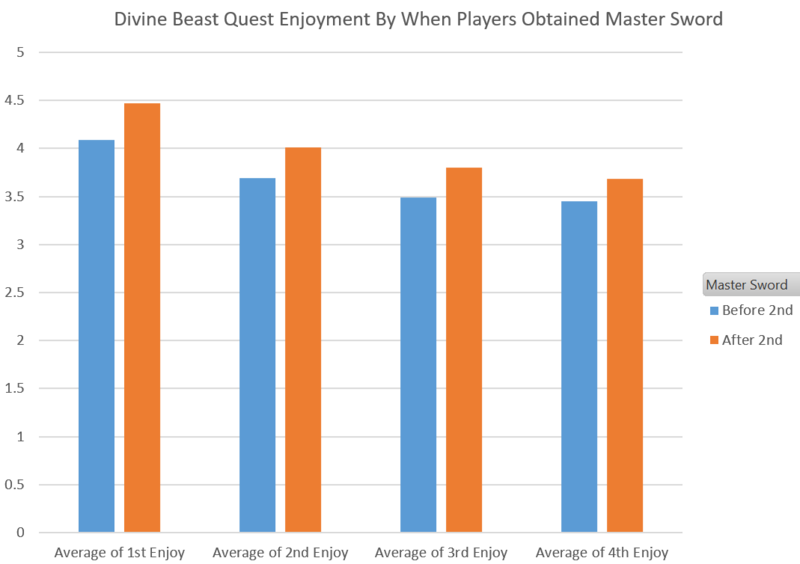 The above graph shows the average enjoyment where players have been grouped by which two quests they completed first. For example, the group of players in the left most set of 4 columns completed Zora first and then Goron (I was in this group). You can see that these players tended to prefer Zora > Gerudo > Goron > Rito. 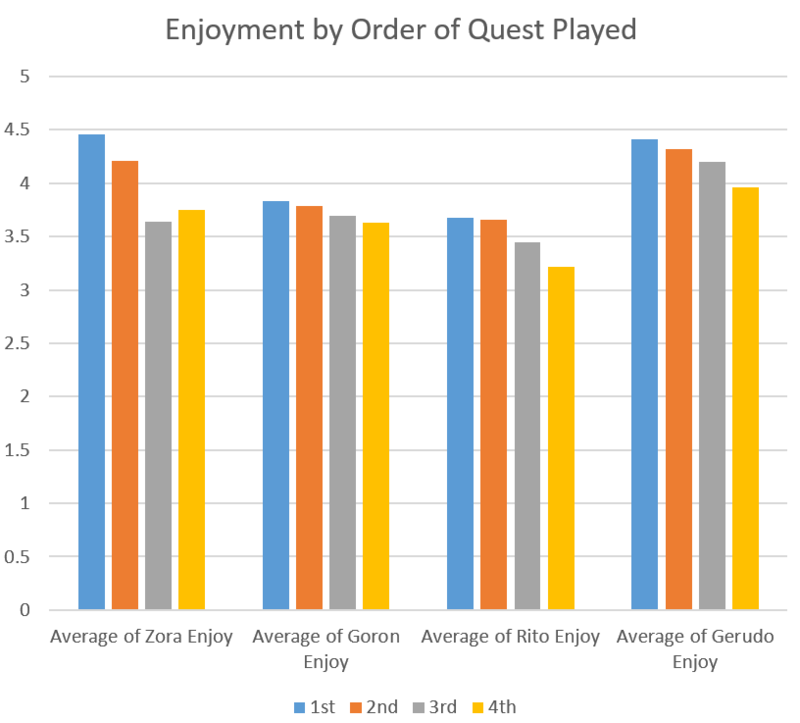 Based on this graph, it’s clear that even the Zora Quest is enjoyed less if it’s played later in the game. You notice the same is true for all of the dungeons. As time goes on, players enjoy the game less and less. We can look at this from a different angle, too. 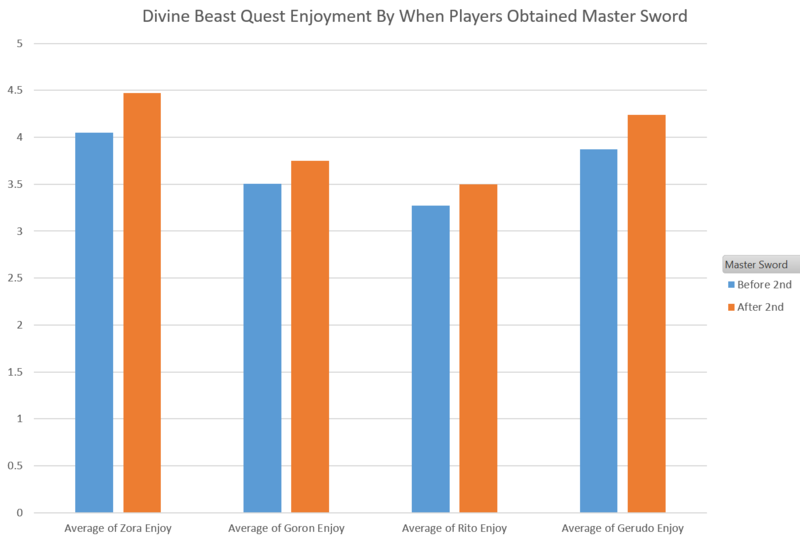 Getting the Master Sword early correlates with enjoying the divine beast quest less. Why could this be? Earlier in the game, the concept is still novel. As you spend more time in Hyrule, it surprises you less. Being surprised is heavily linked to enjoyment. The best games (BotW especially) find ways to surprise you constantly, but even BotW will surprise you less over time. As I found in my post about how the Master Sword effects difficulty, obtaining the Master Sword correlates to players finding the game easier because it’s a heuristic for how skilled a player has become. Additionally, The game does not cater to highly-skilled players. The lack of challenge will naturally cause players to feel increased boredom as they get more skilled than earlier. While the game is good at counter-balancing this (see my post about how BotW handles flow), it’s still not enough to prevent a loss of flow as you get further through the game. My hypothesis is that players who obtained the Master Sword earlier traded their enjoyment of the divine beast quests to enjoy side quests earlier in the game. Unfortunately, my survey didn’t include any questions about how enjoyable players found side quests, but I would wager that if you got the Master Sword earlier, you would also say that you enjoyed side quests more. Comment your thoughts below! What order should I play the divine beast quests? Judging from this, we can see that playing Zora first correlates to enjoying the game more overall. Saving Zora for later would diminish the effect it has on the player. It’s better to do it early while the game is fresh in players’ minds. Other than that, you should try to get Rito out of the way as fast as possible. It’s everyone’s least favorite section, but players who play it first tolerate it better, keeping their average enjoyment up. Keep in mind, correlation doesn’t equal causation. 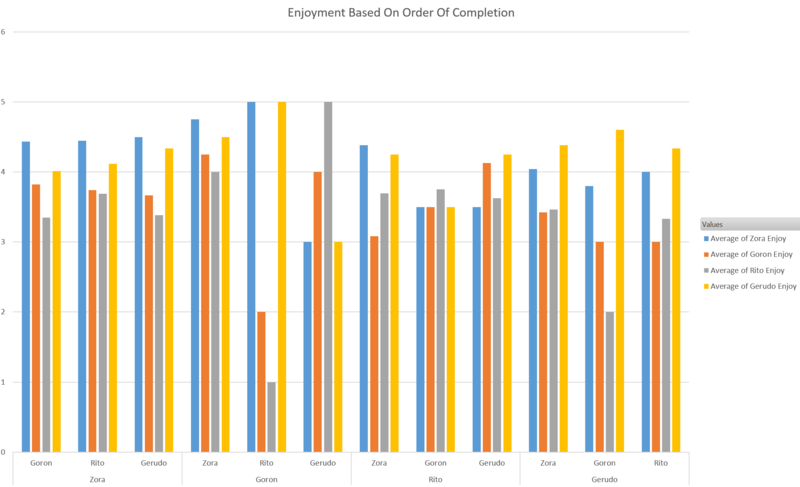 There may be other reasons why these orders correlate to enjoyment in this way. Another explanation for why doing Zora first tends to be more average enjoyable could be that players who play Zora first do fewer side quests on the way, thus are more fresh with the game. Breath of the Wild is an incredibly enjoyable game, but it’s not perfect. As time goes on and players get better at the game and find that they are having less fun than they did earlier on. It’s hard for Nintendo to control what players will feel at every moment in the game due to its non-linear nature. Playing sections at different times in the game will undoubtedly affect how you feel about it. I believe the moral of the story is: play how you want to play. That’s how you’ll have fun!